Top UFC Heavyweight contender Derrick Lewis scored an outstanding comeback win in his UFC 229 fight against Russian fighter Alexander Volkov, knocking out the Russian in the final stages of their fight. Former M-1 Global Heavyweight Champion and Bellator Heavyweight Champion, Alexander Volkov made his Professional MMA debut in 2009 and signed with the UFC in September of 2016. Heading into his fight against Derrick Lewis at UFC 229, Volkov had previously already beaten Stefan Struve, Roy Nelson, and very recently defeated former UFC Heavyweight Champion Fabricio Werdum. 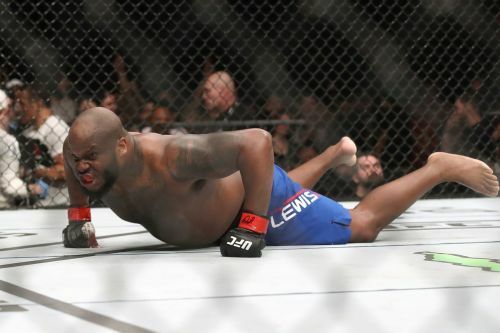 Derrick Lewis, on the other hand, came into this fight with two back-to-back massive wins over Marcin Tybura and top Heavyweight upstart Francis Ngannou, who was defeated by The Black Beast very recently at UFC 226 via split decision. This fight started off as a classic Heavyweight bout with Alexander Volkov mostly dominating the fight in the early stages, throwing in some solid punches right from the get-go that clearly wobbled 'The Black Beast'. At the start of the second round, it was once again the similar story as Volkov kept dominating, with Lewis finding occasional openings. After being dominated for most of the fight, Lewis knew that he had to do something spectacular in order to pull off a huge comeback win, whereas, Volkov just couldn't put away his opponent, who eventually connected with a massive right hand on the Russian in the closing stages of the fight. Lewis finally found a clear opening in the fight and let it all out with ground and pound that eventually knocked out Alexander Volkov with just 11 seconds left on the clock. With this win, Derrick Lewis is now one of the clear favorites to receive a shot at the UFC Heavyweight Championship next, however, as of right now, nothing has been confirmed yet and the winner of the upcoming bout between Francis Ngannou and Curtis Blaydes could very well get the title shot ahead of The Black Beast. Nonetheless, a huge win for Lewis!